Here is a remarkable look at exotic tanks, aircraft, rockets, U-boats and more, all based on actual German blueprints of World War II. Though many German secret weapons developed toward the end of WW II never made it further than the drawing board, some did indeed advance to the prototype and testing stages. Here is a remarkable look at exotic tanks, aircraft, rockets, U-boats and more, all based on actual German blueprints of World War II. Though many German secret weapons developed toward the end of WW II never made it further than the drawing board, some did indeed advance to the prototype and testing stages. Some - such as the half-track motorcycle, one-man torpedo, and rocket-propelled tanks - came to play an effective role in the field of battle. Had the world's first turbo fighter, the Messerschmitt ME.262, been introduced earlier in the war, many experts believe it may very well have ensured air supremacy for the Third Reich. 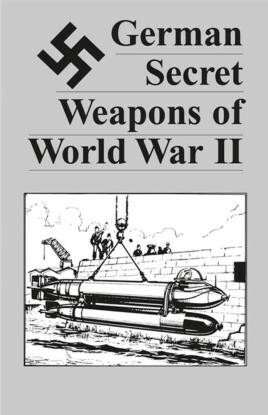 Such secret weapons - and many more - are described herein, each with its own illustration based on secret German blueprints. Covering the bizarre and impractical to the undeniably lethal and effective, German Secret Weapons also contains designs that have been the inspiration for present-day rockets and missiles.